FORD RANGER TURNKEY PRERUNNER- see pics for description. HM Racing Design built, practically new 2017 Raptor with 9,500 miles. This truck was our prototype engineering truck for the Generation 2 Raptor long travel suspension. No expenses were spared on this truck. -RaceLine Monster style, true bead-locks (5 total)-These are real race wheels, not junk. -Tri-Ace: Dakar: 37/13.50/17 - These are real race tire, not junk. Holds spare wheel and jack and can be removed in approx. 5 minutes, so you can have an empty bed to carry your Motocross bike or a Home Depot run! Entire backhalf was Line-X’d professionally. Looks mellow from the outside. Hundreds of hours from Nick at NVFab, one builder the entire time. Truck has been sitting in the driveway for 2 years. Drove around the block just to keep fluids moving. Built it to use it and ended up with a heavy work load and have never been able to use it. The picture of the truck at the dunes is the only off-road action it saw since it was back halfed and caged . That was the test run by builder. 2005 Alumicraft Pre-Runner. Originally built turn-key by Alumicraft. Full 100% bare frame prep done in summer of 2017. Car has been used 3-4 times a year since then. I bought the car with the intention of cruising baja, but time has not allowed it. I have taken it to Plaster City, Glamis and San Felipe. It just doesn’t get used enough. 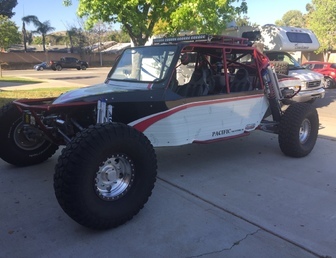 Original owner used the car to explore Baja and go to Glamis with his grandkids. Car is setup to be 2, 3 or 4 seater. 2 seats and rear rack for storage, 3 seats with storage on each side of rear seat or 4 seater. Four new Mastercraft seats (fronts have rear bags and seat heaters); new Mastercraft harnesses. New Graffig 4-way gauge (added fuel gauge); new fuel sending unit. All hardware inspected and/or replaced. The car was torn down to a bare frame and gone through piece by piece. Front shocks are Fox 2.0 air coilover and 2.5 3 tube bypass; Rears shocks Fox 2.5 Coilover and 3.0 3-tube bypass. (5) 35x12.5x15 BFG Mud terrain on Jesse Jones wheels with Champion Beadlocks. Fire out system with Nozzles for front and rear seats. Hi lift jack and shovel mounted. This is the Pre-runner chassis with all the extra “X” bracing and lacing throughout. I have a few other wrap designs done if you would like to see them. The car has an amazing American flag/eagle paint job under the wrap. I also have a new 18 foot Yiro trailer that could be sold with the car, not included in price. I am willing to take the car out to the desert for a test drive with an offer/deposit. Less than 2000 EASY miles on complete build. Never wrecked or had to be fixed in any way. No dents, dings or rust. Runs perfect. Street legal with m/c plate. Fits 4 adults comfortably. 1.75” .120 wall chromoly chassis. 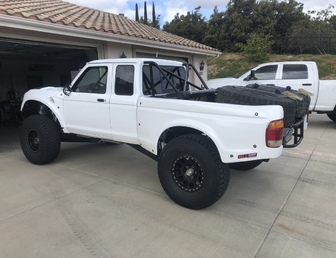 1995 ranger built by SI MOTORSPORTS. Kingpin beans, 4 link, New 10” gear, King 3.0 CO, 3.5 BP, Redline performance 420ci ls3, Culhane TH400, duel trans coolers, radiator up front, oil and ps coolers, duel radio, duel gps, mil spec wiring, redundant fuel delivery system, fire sepression system, containment seats, iNew impact belts, Baja design lights, 60 gallon fuel. Truck comes with spare, gear, upper links, tie rods. Race ready or ready to prerun. Will trade for 6100 truck plus cash. Let me know if what you have. Truck has 200 testing miles on it now. Truck is painted black. Will wrap truck whatever color desired for buyer. Included with price. Much more to this truck, call or text anytime for more info on the truck.